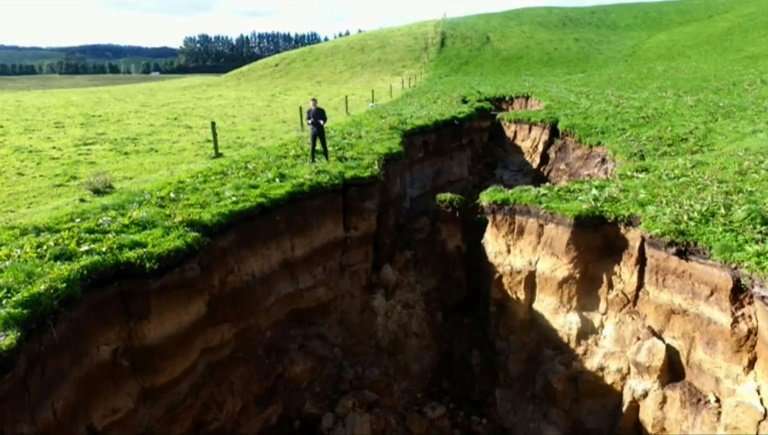 A new sinkhole on a North Island farm as deep as four double-decker buses and almost the length of two football fields has grabbed the attention of New Zealand volcanologists. The chasm appeared after heavy rainfall near the town of Rotorua and left a jagged scar on the landscape, exposing rock deposits from 60,000 years ago. Experts believe rain dissolved underground limestone over thousands of years, eventually causing the ground to collapse and create the canyon. "This is pretty spectacular, it's a lot bigger than the ones I'd normally see," volcanologist Brad Scott said of the chasm measuring 20 metres (66 foot) deep and 200 metres (660 feet) long. Scott said the dairy farm where the fissure appeared lay on the crater of a long-dormant volcano. "What I see in the bottom of the hole is the original 60,000-year-old volcanic deposit that came out of this crater," he told TVNZ. Farmer Colin Tremain said the sinkhole appeared overnight last week and was spotted by one of his workers during an early morning round to attend the cows. While such holes were common on the property, this was by far the largest he said, admitting there was little he could do to stop his land disappearing in such dramatic fashion. "(I'll) put a fence around it and forget about it, waste of time filling it in," he told Radio NZ. 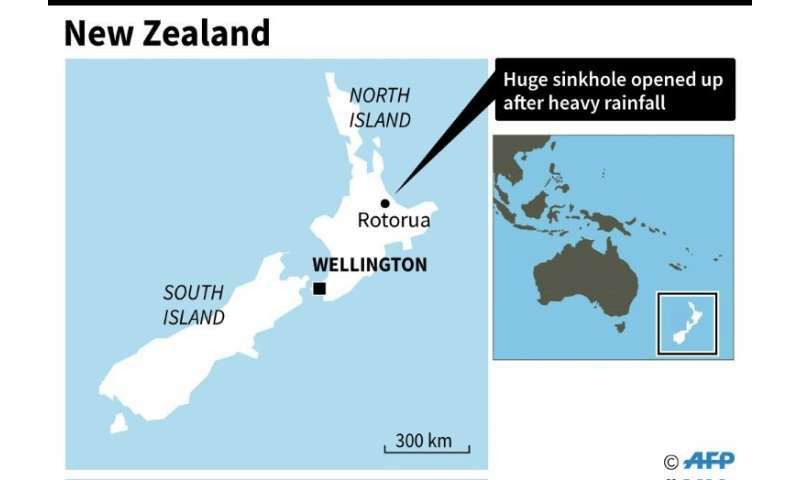 Map locating a huge sinkhole in New Zealand.